Hardwood doors provide a class and elegance that is one-of-a-kind. 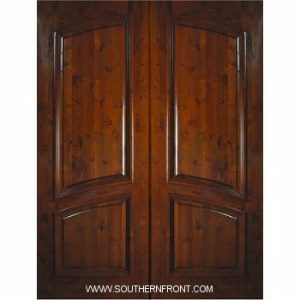 Southern Front Doors offers customers a wide range of residential hardwood front floors in the Houston area. Treat yourself to creating a lasting impression for any person that approaches your front door. Your front door is priority and should resemble who you are. This is not a monthly purchase so treat yourself and then as you walk through the front door, you will have something to show for your success. Doors are top quality with wide stiles and rails, heavy raised molding and thick laminated skins. Jambs are also matching and stain-grade. Doors are finished in Miniwax. Choose from 24 different colors with three coats of marine grade polyurethane with a satin finish. Installation is available for residences in the Greater Houston area. I must not forget to mention our crate and freight program in other words, we include crating, shipping and curbside delivery which is available throughout the United States. Your front door is priority and Southern Front Doors wants to do the work for you and then ship the final product to you so you can focus on more important things. Wood is a natural insulator of heat; thus, temperatures will not be able to destroy it. If you have rooms that include wood doors, you will notice that these doors are able to maintain the temperature of a room. Because Your front door is priority as a bonus, wood doors are great noise insulators. That might be some new information that you hadn’t picked up on before. Wood doors are easy to customize into the look that best represents you. Your custom door can be crafted into a preferred design, polished and painted using any of our 24 colors. 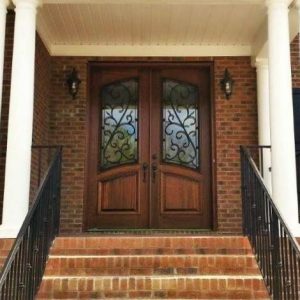 Southern Front Doors has thousands of options available and don’t forget that we have a wood door that can fit any home. Mahogany, Knotty Alder and Andean Walnut wood are durable as a result, your door will last a very long time. Allow this one-time purchase to strengthen your self-image and confidence. Can Southern Front Door be Trusted? Houstonians have been turning to Southern Front Door for doors for eighteen years because Your front door is priority. Our available door options, attention to detail, expert installation and dedication to quality is without parallel in the Houston area. We offer great prices, include an industry-leading warranty and a customer-focused process that makes purchasing a brand new door simple and easy. Come See Southern Front Doors today! Southern Front Doors has an incredible showroom that you can take your time browsing around in. Once you decide on a door, we will have an installer come out to your home to take measurements. Come to our showroom on the city’s north side and Invest in Your Home 11234 Jones Road West Suite B Houston, Tx. 77065 between 9 a.m. and 5 p.m. Monday through Saturday. You can also reach out to us on our website or call us 281-890-5860. Remember, reward yourself by walking through a beautiful front door by Southern Front Doors today!